Free download SUMo latest version 5.0.12.349 from direct download link. 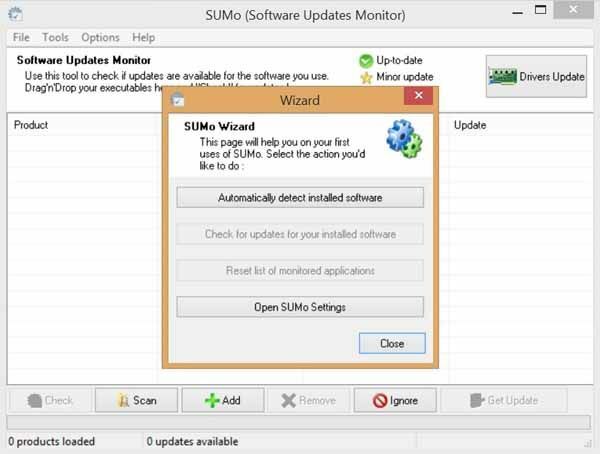 SUMo is abbreviation of Software Update Monitor and SUMo is actually the application software that keeps your PC up-to-date & safe. It always update the most recent version of your favorite software installed on your computer. After installation, you will see a pop-up window within the program with a button “Automatically detect installed software”. When you click on it, it will start to detect software and and done withing minutes. You can hide or unhide Microsoft products from the bottom of the complete alert window. After updating the list, you will see that which software is up-to-date and which is required update. It will also display the available updated version of that software.